GRILLING DIRECTIONS: Bring 1 1/2 quarts (6 cups) salted water to a boil in large saucepan or Dutch oven over high heat. Meanwhile, cut potatoes into 1-inch pieces. Add potatoes to boiling water; return to a boil. Reduce heat to medium; simmer 12 to 14 minutes or until almost tender. Drain. Place potatoes in large bowl. Meanwhile, in small nonmetal bowl, combine vinegar and mustard. With wire whisk, slowly stir in oil until combined. Stir in salt, celery seed and pepper. Add onions; mix well. Add 1/4 cup dressing to potatoes; toss gently to coat. Heat grill. Spread potatoes in grill basket or on sheet of heavy-duty foil with a few holes poked through it. Place basket on gas grill over medium-low heat or on charcoal grill 4 to 6 inches from medium-low coals; cover grill. Cook 7 to 9 minutes or until potatoes are browned, stirring occasionally. Remove potatoes from grill; cool 15 minutes or until lukewarm. When potatoes are lukewarm, pour remaining dressing over potatoes; toss gently to coat. Serve at room temperature. 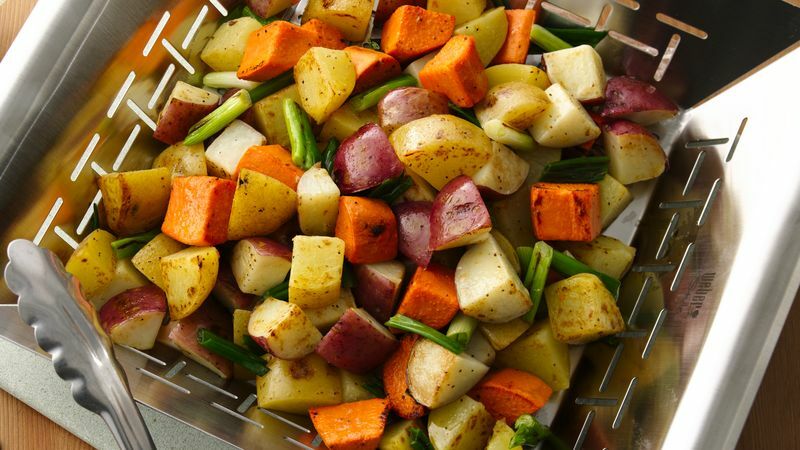 To broil potatoes, place on broiler pan; broil 4 to 6 inches from heat using times above as a guide, turning once.